Earlier this year I applied to the National Lottery for their “Awards for All” grant after my pilot abcd retreat in 2016 was a huge success to support breast cancer patients going through and after treatment. The application was granted and I was able to share 3 dates on social media for people to be able to book on in June, September and October 2018. Three days later I nearly had the full 50 people for the 3 dates! After some swapping and changing with people (yes when people have cancer they do have a lot to juggle sometimes with treatment and appointments aswell as work and lives) we finally filled the dates. The first one was 5-7th June and suddenly I had lots to organize! As I had done this before I had a template so it was easier than doing it from the beginning making organizing much easier. I had the right professionals delivering the right exercise and holistic therapies. Just a few changes from the original and it was near perfect to what I wanted. I had booked a hotel to accommodate 20 people but sadly they had to cancel as they had double booked my event. This event then had to be reduced in numbers due to accommodation availability. 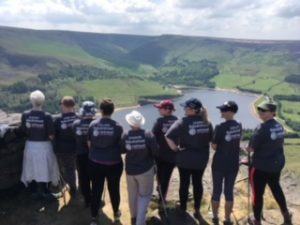 Quickly we had to book two hotels (there wasn’t one in Saddleworth that could support the total amount of people due to the lateness of the change) so wasn’t ideal but never mind, hopefully for the next times it will be right. All other hotels were booked and logistics wise I couldn’t use accommodation outside the area so that’s why I kept this to 10 people. They were split 6 people in The Old Bell in Delph and 4 people in The Diggle Hotel (surprisingly in Diggle). They arrived from 3pm on the Friday night (furthest away was Edinburgh!) for a meet and greet and I only knew one person from a tweet up we had in Manchester a few months prior. 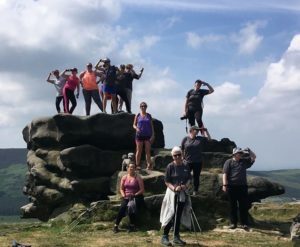 Myself and another organizer collected the 4 from The Diggle at 5pm to take them to the Old Bell (5 minutes away) for a “meet and greet”. We were able to use a lounge area, away from the main hotel area for residents and this was ideal to have a chat, explain why this has all come about and the ethos behind it all. The ethos is very simple as it is all about motivation to help patients exercise, aswell as wellbeing and support. There is research proving that exercise can help reducing the risk of a recurrence. All patients fear recurrance so being able to take this matter into your own hands to try to help yourself is a very beneficial thing to do. U Projects (Alan & Gaynor) who were delivering the jogging and nordic walking elements came to say hi and explain what they would do. Meal over we stayed and chatted for a while but some of the ladies were ready to retire for the night so I was able to take the ladies staying at The Diggle back with me and drop them before heading home ready for the start of the reason why they had booked on the exercise retreat! 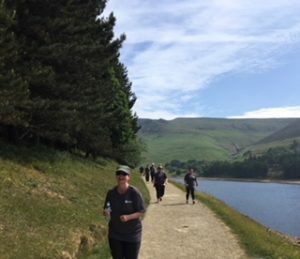 The next morning we met promptly at 9:30 at The Diggle Hotel for the mini bus to take us to Dovestones ready for the jog down the hill led by Alan & Gaynor from U Projects, and then out jogging at the side of the reservoir. The views were amazing and the weather was absolutely perfect. Not too sunny but quite warm, dare I say it may have been a little to warm! Everyone did excellent and some really surprised themselves as to what they could do. I must say that the exercise is for all abilities. 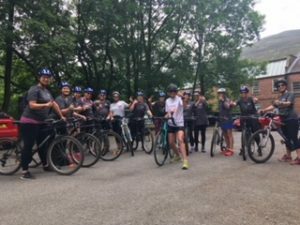 There were beginners/novices for many of the activities but this didn’t put people off and I was so happy to see the enthusiasm. A little scary of course if you haven’t done things before but when you are with like minded people who have gone through the same treatment and issues then it makes things a whole lot easier and relaxed. It’s very focused on being in a group. The Disclaimer which was sent out prior with health questions etc was there to help us to know how to if people were able to do certain exercise aswell as to cover us if there is a problem and cover you in case of any accident. This has to be signed off by a clinical professional who knows you and your disease (GP or oncologist or Breast Care Nurse or Clinical Nurse Specialist) We had one lady who (medically) could not run (spine mets) and another who didn’t want to run so there was a small group who, when we jogged, they walked to the point we met at. They walked with one of the group leaders. Everyone else threw themselves into the jog, many way out of their comfort zone but it did show them that they could actually do this and gave them a great sense of achievement. They certainly had a buzz about them. At the top they mounted again and we set off to the right of the reservoir and to 1/2 way around the reservoir. Everyone did this at their own pace so little groups formed with people chatting and cycling. The views were beautiful and the pathways wide enough for people to be able to cycle to pass walkers or other cyclists. Sadly there was work still being done on the dam wall so we couldn’t ride all the way around the reservoir. So we went back the way we came. This was nice as you then saw the reservoir from a different angle. The mini bus met us at the top of the car park so that we could get back in time for lunch. Lunch was at my house, as it was easier for the two hotel groups to be there and sandwiches, tea, coffee and cold drinks were available. Fed and watered and recovered from a busy morning of jogging and cycling they were now onto the relaxation side of the day. The Minibus took us to meet Maureen Wray from Yoga Yourself who teaches Iyengar yoga. Maureen had been my yoga teacher for a number of years so I knew the ladies were in safe hands. I didn’t attend the session but one of the leaders did and she said they loved it. Yoga is good for your mind and body especially for breast cancer patients and again, research has been done in this area proving the benefits. 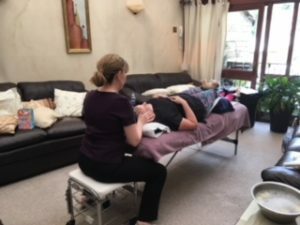 An hour later they came back, relaxed and rejuvenated ready for the next session which was a lovely treatment in the private lounge area with Tina Murray from Old Mill Therapies. She uses Jennifer Young skincare on the ladies with whatever treatment they had and then Jennifer had kindly sent some testers over for patients. Here is the link to her skincare range which has been specifically created for patients who have had or going through cancer treatment. I stayed for a while so that I could take the Diggle ladies back to their hotel ready to be collected for the evening. 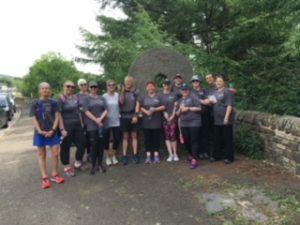 Rested, pampered and freshened up, they were ready for a meal at Fresca Italian restaurant in Delph just a 2 minute walk from the Old Bell. The meal was lovely and again everyone chatted and had a great time with much laughter and talk about the day and anticipation of the next day. An early morning and the mini bus picked everyone up from my house as they drove there so that they could all set off after lunch from this point and didn’t have to go back to their accommodation, as they had to be out of their room that morning. We set off with the view of Pots and Pans in the distance. Driving up to the drop off point they could see clearer where we were heading. 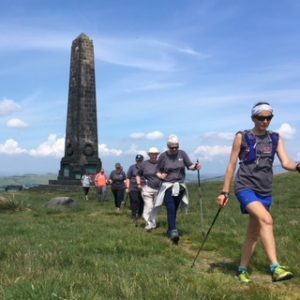 We met Alan and Gaynor from U Projects who did a quick talk and explanation of nordic walking and the technique and how it can burn 40% more calories than normal walking (now these people don’t seem so silly with their sticks!) and not just that, the benefits again for breast cancer patients for moving lymph around from their arm nodes has proven research that this type of exercise actually helps. A quick demo and everyone had the chance to try the technique on the flat. Now we were going for the challenge of uphill to the war memorial Pots and Pans which is 580ft above the drop of point! Slowly and again at our own pace we walked up the hill using the poles for support on the hilly ground aswell. It took a good 20 minutes to walk up the main part of the hill and to the memorial. 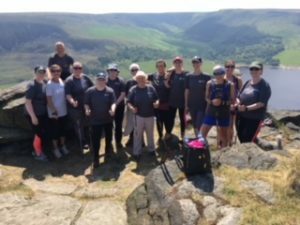 A massive achievement for us all but the icing on the cake came when we walked over to Alderman’s hill which is a rocky point above Dovestones and the view was spectacular! 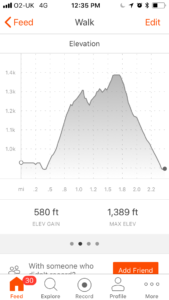 It overlooked where we had jogged and cycled the previous day. A little tear and a big high 5 for everyone it was the fantastic finale that I wanted them to see and it is a breathtaking finish to the weekend with such amazing scenery. Photos over we then descended down the mountain to the mini bus pick up point and back to my house for lunch. To my surprise the ladies had decided to do a collection as on Saturday night one of the ladies had very kindly contributed hugely to the evening meal. It was a lovely gesture and so the ladies felt that they wanted to give their contribution to abcd for future people to benefit from this. What a lovely end to a fantastic weekend. A big thank you to my helpers Trish and Cindy aswell that weekend for the support they have given on the actual retreat and behind the scenes. 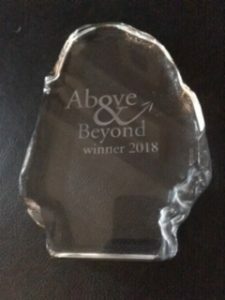 BUT that wasn’t the end of the weekend as I received an Award called Above and Beyond! 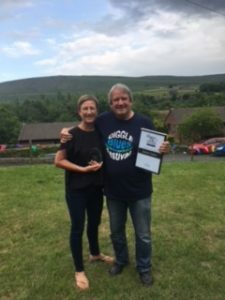 A local Diggle resident Dave Wood had spoke to me a few weeks prior to ask about abcd and what I provide, as he runs a yearly music festival called Diggle Blues Fest which came out of his love of blues music. The event has grown over the past few years and they do give some funding to good causes. abcd was on his radar and after our chat, he kindly sent me a cheque for £100 towards the retreat. Then, unknown to me, he applied for a local community award called Above and Beyond, which is promoted by local Journalist Kenneth Bennett. I was asked to attend the Diggle Band Club on the Sunday evening and after Dave announced why I had been nominated, I was presented with a certificate and a lovely glass award below. A lovely end to a great weekend with amazing new friends. Looking forward to the next retreats in September and October! 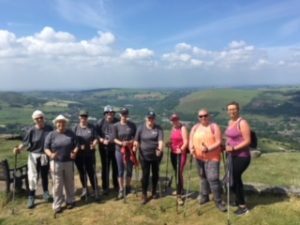 If you want to find out more then have a read here >>> http://www.abcdiagnosis.co.uk/lifestyle/abcd-retreat/ dates are provided for 2019 and you can email me on jo@abcdiagnosis.co.uk if you are interested.